Here is a typical (composite) drawing of a mature grass plant with the various features labeled. The two main areas to focus on in grass identification are the collar region (leaf attachment to stem) and the inflorescence (flower). The collar region contains the auricles and a ligule sometimes called a rain guard because it is said to keep dirt and rain from fouling the sheath. Auricles are appendages at the opening of the sheath. Various grasses have an amazing but differing combination of these features. Just as humans have a face with eyes, nose, mouth, and ears yet are very distinct, grasses have a collar region to help distinquish them. The collar region is important because it can help in identification soon after emergence. Inflorescences are distinct but only appear during the reproductive stage of growth. Knowing the various parts of the collar area is the key to learning to identify the various grasses during vegetative stages. Although the collar area contains just a few elements, the various combinations of such features are amazing. Most grass species have a ligule but ligules can be hairy or smooth, of many different shapes and heighths, and membraneous to papery. 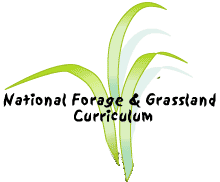 Barnyard grass is the only common forage grass that does not have a ligule. Many grasses do not have auricles so focus first on the ligule's physical characteristics. Then look to see if auricles are present and, if so, what characteristics do they have: clasping extensions, wavy folds, pubescence. Grasses also have some variety in the sheaths where the leaf wraps around the stem. Some sheaths are overlapping and tight while others are open like a man's suit jacket. Various shaped auricles or lack thereof, differing ligules, the presence or absence of hairs, and differing sheaths, are the ways thousands of grasses can be distinquished. Grass seedlings can be very similar. But a new grass seedling can also be identified by digging up the seed. Grass seeds differ although they do not have as many dramatic characteristics. Yet seeds retain their color, shape, and other characteristics well even when buried for a long time. Generally, grass seeds are long, slender, beige to tan, and translucent. Some grass species have awned lemmas. One seed characteristic that may clearly identify grass species is the shape of the rachilla joint still present on the seed. The rachilla is the axis that connects florets to the spikelet. Different grass species have different rachilla joint shapes. The first is of perennial ryegrass and the second photograph is of a meadow foxtail seed. The bent awn is quite noticeable as is the pubescence (hairs). Grass leaves may seem very similar but they actually have a wide range of green colors, textures, markings, and surface characteristics. When learning to identify grasses notice whether leaves are ribbed, veined, keeled, or tapered. Some grasses have "V" or "W" markings and leaves can be smooth, jagged, glossy, dull or a combination since tops of leaves often vary from the bottoms. New leaf blades are either rolled or folded within the stem waiting to be pushed up to unfurl. Some species are identified specifically by their rolled or folded leaf buds. When learning to distinguish grasses, determining whether the grass has stolons or rhizomes can also help. Stolons are modified, propagating stems above ground creeping and rooting or curved over and rooting at the tip. Rhizomes are underground stems, or rootstocks. The rhizomes of grasses are usually slender and creeping, with scales at the nodes. Many forages grow with stolons or rhizomes, eventually developing a thick stand. Plants can have stolons, or rhizomes, or both, or neither. They are shown on the composite drawing above.